Coach George has been appointed head coach for next season. For information on next year's team, contact him at 416-778-0280. Our team party was a success with a good turnout and lots of fun and food. For families that would like a full team set of the baseball cards we presented each player, just contact Coach David and we'll have more printed up. Cost is $15. What a way to end the season! Play into September and finish among the top half dozen teams in the provincial championship tournament with a record of 2-2. Congratulations Bulldogs. Thanks to Lisa Cherry for the photo - Look for more on our SOBA photo page. Stay tuned for news of our year-end awards party. Way to go team! 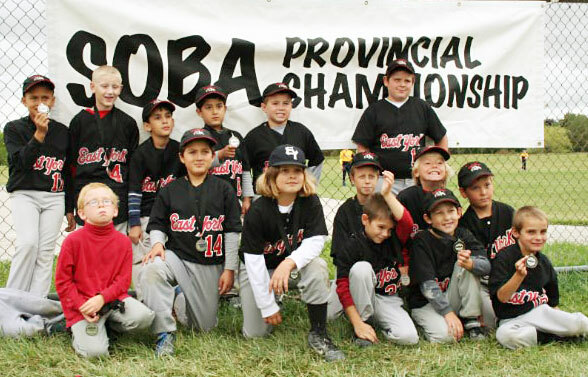 What a fantastic weekend of baseball at Wishing Well: SOBA TBA East finalists and a spot in the provincials. Congratulations to all of you, it was a superb effort over six games in three days. Check out our photos (thanks Colleen). The standings have been updated and we are in third place with a record of 4-2-2. Therefore, our chances of going to Richmond Hill on the long weekend are good, so please make arrangements and let me know if you are unavailable so I can call up replacements. Our practice location for Wednesday has changed. We will meet at Gledhill School where there are two small diamonds we can use. The school is at the foot of Gledhill Avenue, a block above Danforth. Gledhill is the street that runs south from Stan Wadlow at the Curling Club. At the south end, Gledhill is at Toronto Honda. Wow! A breakthrough weekend for the team and a tremendously gutsy performance in Etobicoke by everyone: 3-0 in a tournament for the first time. It was a big disappointment to lose the semi-final the way we did but still, we fought back to the end. Congratulations to everyone. The biggest lesson of the day was a tough one, baseball can be cruel. Sometimes the decisions go our way and sometimes they don't. I know there were questions we could have asked about "the call" in the 7th but I know from experience that those arguments go nowhere and are best chalked up to experience. Coach George will be guiding you for the next two practices and games while Coach David and family are up north on vacation. Good luck against North Toronto and Wexford/Agincourt. Babe Ruth becomes the first player to hit 30 home runs in a season. The historic home run breaks his own season mark of 29 and the ‘Rajah of Rap’ finished the season with a resounding 54 round-trippers. Congratulations Bulldogs on your first ever weekend of "Baseball Survivor-West Hill". It was a long day and took its toll by the third game but you all held up well. There were some good moments to learn from. And, to follow up with a convincing win on the Sunday evening against North York was a nice way to end the weekend. The schedule has been updated to show all our games this weekend and next. Let's put up some crooked numbers on that page! Please note, there is a slight change in our league schedule for July 16. Our game against Birchmount is now at Anson Park, 30 MacDuff. East of Brimley, north of St.Clair. off Oakridge Ave.
And for those of you who were wondering about the basketball off the tee drill, check out the Baseball Corner's web page on batting. Congratulations Bulldogs, a nice way to end our first tournament: with a big 15-0 win and a medal! With fewer errors Saturday we could have been playing Sunday night but, ah well, we'll get 'em next time. Well done Bulldogs, a 4-4 tie against a team that's been doing well against the other teams in the league. It was obvious our practice made a difference and there was a 100 per cent improvement tonight, congratulations. We are looking at holding some additional hitting practices, which we will try to organize, probably working with a portion of the squad at different times, as you are available. We'll post the times as soon as we can schedule time in the batting cage. 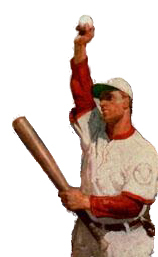 Hey Bulldogs, here's a link to our new games page of interesting baseball fun stuff. Let me know which ones you like. The club has postponed the team photos to June 27-29. Please try to ensure you are available for June 27 for the group picture. If for any reason you can't make it that day, you can still have your individual photo done on one of the other nights. The League standings are now posted and you can view them at the TBA Rookie East Standings web page. Our tournament schedule for North Toronto, June 23-25, is now posted on our schedule page. This Day in Baseball: 1989 - For the first time in major league history, the same game is played partly outdoors and partly indoors as the Blue Jays beat the Brewers, 4-2 in a contest which features the closing of the SkyDome's retractable roof in the fifth inning due to inclement weather. From This Day in Baseball on our Links page. Hey, Jr. Bulldogs from the Taxi Squad, you now have your own schedule posted on our Web site listing the practice dates and tournaments when you might be needed. If you are called up to play on the Sr. squad for a regular league game, maps to the parks are linked to the Sr. schedule. The schedule will also list any exhibition games we arrange for you. East York Bulldogs Rookieball Selects Baseball Team.